IU Southeast is a place where diversity, tolerance and inclusiveness thrive. As such, our university is once again a proud sponsor of the second-annual Jeffersonville Pride Festival. 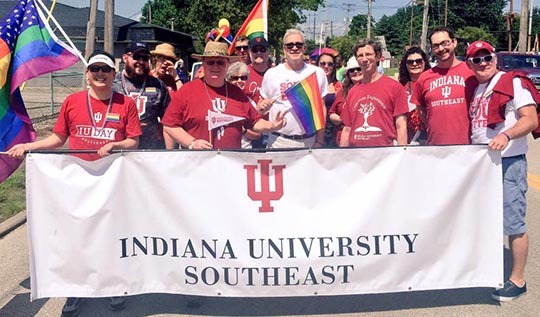 We invite you to show your support of our LGBTQ community on Saturday, June 10, by walking alongside Chancellor Ray Wallace in the parade or working in the IU Southeast booth at the festival. All IU Southeast students, faculty, staff, and their families are invited to join us in Historic Downtown Jeffersonville by walking together behind the IU Southeast Banner or by simply cheering us on as a spectator. We would like to have a great IU Southeast presence, so the more the merrier! Time: All walkers must be at the start location by 3:30 p.m.
Attire: All walkers should wear some IU Southeast gear. Items promoting other universities should not be worn. If you are interested in working the booth, please email Greg Roberts directly at grobert3@ius.edu. If you would like to join us by walking in the parade, please sign up online today! More information can be found at the Jeffersonville Pride Festival website.